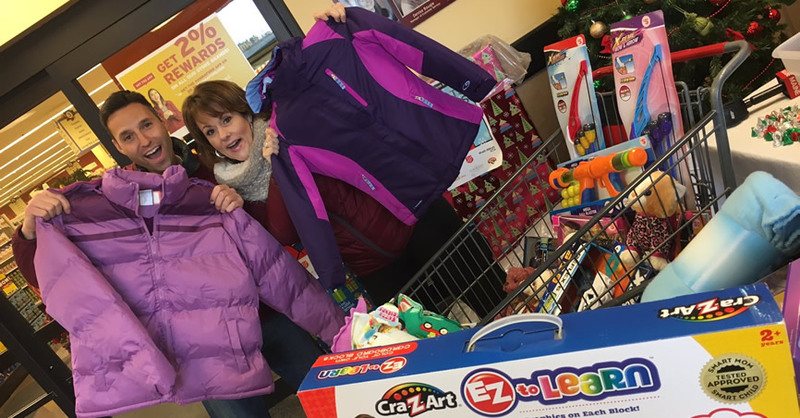 PORTLAND, ME – On a brisk Saturday, the first day of December, Mainers showed up with car loads of coats and toys to donate to Coats and Toys for Kids Day – an annual event sponsored by NEWS CENTER Maine. In one day, more than 4,500 new and gently used coats and more than 5,000 new toys were collected for distribution. NEWS CENTER Maine broadcast from eight live locations throughout the state including a Hannaford store in Augusta, Newport, Sanford, Waterville and Machias. Also, at Shaw’s in Bangor and Auburn and Pratt-Abbott Cleaners on Forest Ave in Portland. “Combine the single day event with the month-long Coats and Toys for Kids campaign, and we collected an estimated 17,200 coats and 6,710 toys,” said Brian Cliffe, President and General Manager of WCSH. Coats for Kids was originally designed 36 years ago by the Salvation Army, with NEWS CENTER Maine becoming partners 7 years later, to collect coats for the kids of Maine from families who cannot afford a warm winter coat. Each year in November, donation boxes are placed in the Hannaford Supermarkets and Shaw’s stores across the state for Mainers to bring in toys and gently used coats. In 2004, NEWS CENTER Maine also saw the need for toys during the holiday season and expanded the program to Coats and Toys for Kids. All the coats are cleaned and stored by Pratt-Abbott Cleaners and the Salvation Army distributes the coats and toys. Pepsico (formerly Pepsi) has assisted this great effort by donating and delivering the boxes to Hannaford Supermarkets and Shaw’s stores. Springer’s Jewelers also helped with a financial donation. By estimation, NEWS CENTER Maine has collected more than 832,200 coats in the last 29 years- all of which have helped to keep Maine children warm. Since 2004, they have collected 70,710 toys to distribute to those in need during the holiday season.